Daniel Neish is an artist living in the Seattle area. 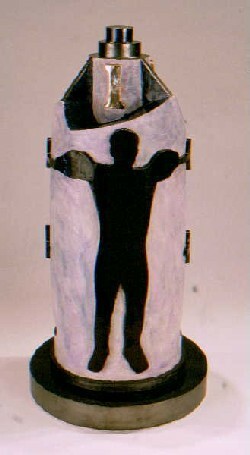 He divides his work between Ceramic sculptures and Paintings. The original intent of this body of work was simple; portray people from my local gym. Their conversations often times consisted only of phrases associated with weight lifting. Thus: PUSH, BUILD MUSCLE FAST, SQUEEZE, etc..., is the vocabulary of the gym and becomes that of the work. As the work progressed it took on new meanings, those even more closely associated with this pursuit of the perceived perfect body. This then becomes an expression of how we present ourselves on the outside vs. how we really are on the inside. 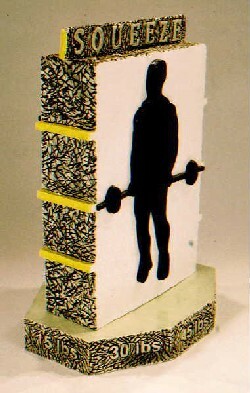 I attempted to expand this idea of the inside and outside of a person into the later ceramic pieces in this series by emphasizing the importance of the interior. The interior of the person is often unseen on first glance, but can eventually be revealed. In the later work I further expanded the idea that with a little effort the unseen interior is also revealed, thus showing a different aspect of the piece. The exterior of the piece represents the shell of how we present ourselves, and the interior another aspect of who we are. Much like people in real life.